Two new iridium(III) complexes were synthesized and fully characterized, [(bo)2Ir(pzpy)] (2a) and [(bo)2Ir(pzpyz)] (2b) (where bo = 2-phenylbenzo[d]oxazole, pzpy = 2-(1H-pyrazol-3-yl)pyridine, pzpyz = 2-(1H-pyrazol-3-yl)pyrazine). The single crystal structures of 2a-2b have been determined. Considering the relationship between their structures and photophysical properties, DFT calculations have been used to further support this inference. These Ir(III) complexes emit from the excited state of 3MLCT/3LLCT in the green and yellow region, and the quantum yields in the degassed CH2Cl2 solution at room temperature are 35.2% and 46.1%. 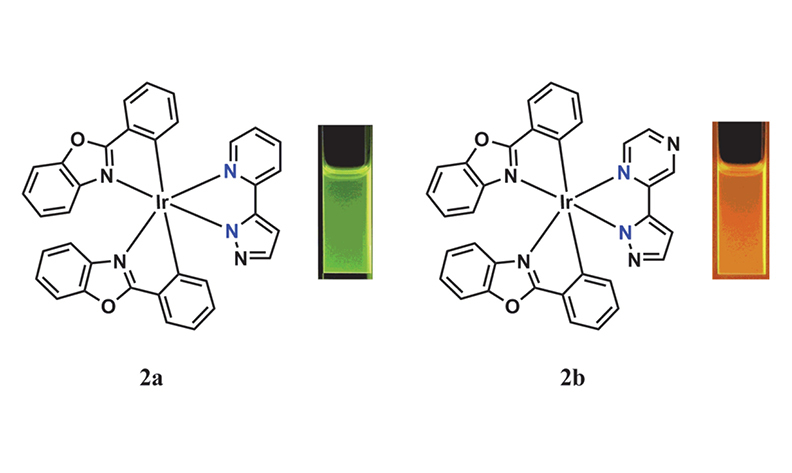 Theoretical and experimental results show that iridium(III) complexes 2a-2b are promising phosphorescent material.